This year's shot is doing a lousy job of protecting people against the nasty strain of flu that has dominated so far this season, according to a preliminary report on vaccine effectiveness released Thursday by the U.S. Centers for Disease Control and Prevention. That's no surprise. Australia and Canada had already released dismal effectiveness numbers — 10 and 17 percent, respectively — against the H3N2 flu, a strain that is notoriously resistant to typical vaccines and has caused 70 percent of flu cases so far this season. Flu keeps intensifying across the U.S., including Pa., N.J. The CDC said that the overall effectiveness of this year's vaccine is 36 percent. This does not mean that it kept 36 percent of the people who got it from getting sick. In CDC parlance, it means that getting the shot reduced the risk of having to go to the doctor because of flu by 36 percent. It was only 25 percent effective against H3N2. A bright spot was that the vaccine provided better protection for children. Scott Hensley, an associate professor of microbiology at the University of Pennsylvania who studies flu vaccines, said this year's vaccine is about as effective against H3N2 as last year's was. That's not great, but it's still valuable to get the shot. Even if people still have symptoms, he said, shots usually reduce the odds of severe disease and hospitalization. In its report, the CDC also emphasized that there are weeks left in this year's flu season and people should still get shots. They may reduce the severity of symptoms in those who get H3N2, and they work far better for the other types of flu — H1N1 and influenza B strains — that are now starting to make more people sick. The agency also recommended that vulnerable people seek medical attention quickly so they can start antiviral medicines, which can shorten the course of illness by a day and reduce the odds of being sick enough to require a hospital stay. 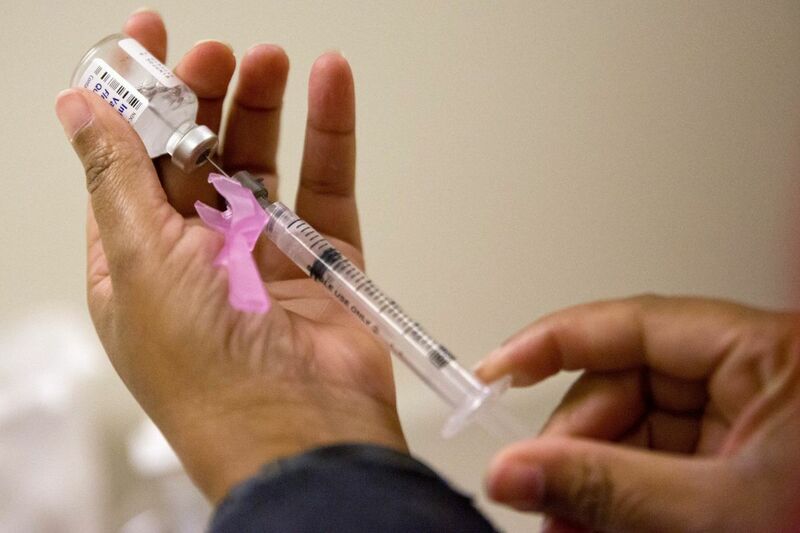 Tina Tan, an internist who is state epidemiologist for the New Jersey Department of Health, said that no vaccine is perfect and that this one is still helping some people. "It's better than nothing," she said. The vaccine's effectiveness was rated at 67 percent for H1N1, a type of influenza A, and 42 percent for influenza B strains. In general, viruses in the influenza B family cause less serious illness than those in the A group. Hensley's work has shown that the way most flu vaccine is manufactured in this country, which involves using chicken eggs as a growing medium, creates changes in vaccines for H3N2 that make them less effective. The U.S. government, he said, should invest in research and large clinical trials that explore better ways to make flu vaccines. He added that older people generally have less effective immune systems and that many Americans over 65 are facing an extra challenge when it comes to H3N2. People's response to flu, he said, seems to be primed by the first type of flu they encounter as children. H3N2 circulated among humans for the first time in 1968, so people born several years before that tend to have less effective immune responses to it than those born more recently. Flu has been particularly widespread this year, at times affecting virtually all of the United States. "This flu season continues to be extremely challenging and intense," Anne Schuchat, acting CDC director, said during a media briefing Thursday. In it report, the CDC estimated that flu led to more than 17,000 hospitalizations this season through Feb. 3. What happened during the 2012-13 and 2014-15 seasons could be an indication of how this one will go, the agency said. During each of those seasons, flu accounted for around 710,000 hospitalizations and 56,000 deaths. This year's flu had killed 63 children by Feb. 3, the CDC said. Among the 54 whose vaccination status was known, 74 percent had not been vaccinated. According to the most recent reports from state health departments, the flu is still a potent force in New Jersey and Pennsylvania. For the week ending Feb. 10, New Jersey reported high flu activity across the state. The percentage of visits to emergency departments and admissions to hospitals from emergency departments continued to climb, though not as rapidly as in the previous week. The school absenteeism rate was above an average of the three highest flu seasons for the week but well below the peaks of previous seasons. Pennsylvania reported that flu activity backed off slightly last week in much of the state, though visits to emergency departments for flulike illnesses were still up sharply in Southeast Pennsylvania. Sixteen flu-related deaths were reported, bringing the state total so far this season to 107. That is above the number for the entire season — 65 — in 2015-16, but below season totals for all other years since the 2012-13 season, when 200 people died after flulike illnesses. The highest total was in 2014-15, when 221 deaths were reported. The good news, Hensley said, is that we've already had large numbers of H3N2 cases for two years in a row. It's unlikely that there will be a lot of it around next flu season.